My retail sales training began at the feet of others. Just like Kevin Spacey, who worked in the San Fernando valley a few miles away, I put myself through college in the seventies as a men's shoe salesman. Mine was run by a manager whose simple motto was, "Sell shoes." Once you engaged a customer, you went to the bottom of the order. As enough customers came through, you progressed up the order. When it was your "up" that meant you got to wait on the next customer. Whether you sold them or not, that was your chance to make a sale. Blow that, and you were back at the bottom. Don't satisfy them and you got returns which cut into your paycheck. Because of that, you had to build trust with a customer quickly and, knowing how much guys hate to shop, make it easy for them to get their annual shoe purchases out of the way. Which meant always looking for the higher ticket via helping the customer get what they wanted. Most clerks in shoe stores would just ask a guy's size when he picked up a shoe. Our team always replied to the customer, "Let's check that, because one foot might be larger than the other." #1 Because it saved us time, half the time the guy was off by a size he told us. #2 Because if you didn't know up front his length and width that the guy had very narrow or wide feet, or if his instep was too high or low, it would automatically limit the choices the salesman had to work with. Having understood why we measured everyone, the salesperson was trained to mentally match up the customer’s foot and what they said they were looking for before going to the stockroom. That way, if the customer had limited options, the trainee could collect all of his choices at once, saving the customer time and maximizing the sales opportunities. This step also kept trainees from going into features and benefits on the sales floor about why a particular product was so well made or why it would fit a customer’s foot, only to go to the stockroom and discover there was no shoe in the customer’s size. When I took over the store, I trained the men's shoe salesmen to bring out four boxes of shoes; the requested pair, a pair in the same color, but different style, the originally requested pair in another color and a casual. 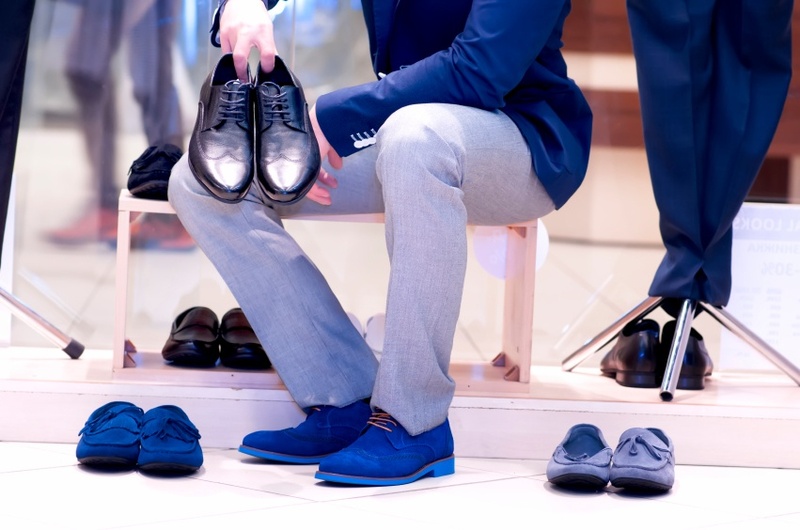 After the customer decided on the original pair, he would invariably ask the salesperson, “What’s in those boxes?” This is much easier selling when they ask rather than you push. The salesperson would reply, “I found a few others in the back. Would you like to see a few more in your size?” The customer would, ninety-nine out of one hundred times, answer "Yes" They’d often buy two or three pairs of shoes where many shoe stores would have sold just one, if that. 1. A unified focus on what the #1 job was: sell shoes. 3. Getting ahead of returns. I know a lot of people who made money selling at retail - particularly in shoes. The whole experience was one of pampering and catering to the customer. Contrast that to the experience now that you have to try on your own shoes after asking for your size and trying to figure out if they fit. No wonder so many shoe stores are nervous about online retailers! 'Cause here'e the thing, if all your clerk can do is run and fetch product from a stockroom - either aided by an iPad or not - they add no value to the transaction. That part-time job selling shoes is where I first learned much of what I still teach today about persuasion, presentation skills, energy, selling techniques in retail, teamwork and success. Nowadays, I study what seemed so simple and try to put into words what is so very hard for so many. Customers don't realize that when they have an exceptional experience it is not by chance, but by the training given to the employee. Retailers of all sizes need to get back to basics and look at who they hire for the floor, how they are onboarded and how retail sales training can be mutually beneficial for all.